Betway is an online bookmaker that exceeds expectations; a mid-size company producing top 5 results. Favourable odds on most lines coupled with both a desktop and mobile website that you might even look forward to using make this a bookie that could cause a real headache to some of its competitors. Well known throughout Europe, Betway serves as a good option for those who enjoy wagering on fixtures outside of the UK as well as inside, and when it comes to in-play or Esports betting you are unlikely to find much better. They may have only joined the party in 2006 but they are already a favourite of many regular bettors, not just because of the service and products they offer, but also because of some well proposed bonuses and promotions. A perfect blend of work and play. 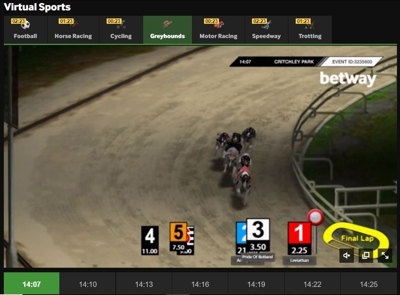 There is a great sports line up on Betway’s website, bringing together more than 30 categories with many containing hundreds of events; there are even lines on Football games in the bowels of Bahrain’s Second Division, for example, or on who will be the next Prime Minister – of Denmark. They don’t cover the Greyhounds extensively, although the Horses are given plenty of attention globally, with BOG available on all UK and Ireland races. Market depth can vary from sport to sport as it can anywhere else, but they are certainly up there with the best in terms of numbers, and if you are desperate for odds on something that you can’t find you can always ask or Tweet them using #betyourway. It’s unlikely you will need to though, they cover a lot of ground especially within popular categories. Some ongoing promotions which might crop up such as 4 to Score (free to enter, pick the first goal scorer in 4 games), #betyourway (where you can ask for odds on anything), and the Free Bet Club (get a free bet after betting x amount on trebles or higher) add plenty of value to your time spent on the site. Not that added value is necessary to convince punters to bet with Betway. In general, odds tend to be higher than average across the board, and enhanced odds are usually available every day too. The In-Play area could be described as a mini version of the website as a whole, and it’s a cracking bit of kit. The events within your chosen sports category will be blinking away as the colour coded live odds go up and down, and basic match info such as current score, who is serving, and most popular odds are in view as well. If you are following a number of games at once and only need the fundamentals you can switch between bet types without selecting a particular event, but there is much more market depth once a game is selected. The infographic for each sport is one of the most dynamic we have ever used with multiple ways to follow the action (game graphic, scrolling updates etc) as well as detailed game stats with the court/pitch also serving as a map of sorts, plotting where key events have happened and highlighting action zones. It feels interactive and fun but is also the business. Markets offering cash out are clearly marked as well. Odds on in-play markets don’t tend to be the highest, but they don’t fall too far behind. Football is probably where they perform the worst but there isn’t usually much in it from bookie to bookie anyway so the difference is often minimal. Still, if you are hawkish when it comes to getting the very best prices this might put you off. The sports list is good although not necessarily the biggest, rest assured that the big events will always be available, though, and what they do cover is covered in depth. A good example or average is 60+ markets for lower league international football games – which gives you some idea of just how many there will be for the really big fixtures. Where Betway really scores highly is the quality of their Live Streaming; it’s better than some in the top 5 if you ask us and is available on a generous number of fixtures. A minimum stake may be required (£2 for Horse Racing) but what you get is quality. This all ties neatly together to give a well packaged in-play product with every individual aspect complimenting the other, keeping the punter well informed by providing a fully rounded service. The banking area is impossible to miss and easy to use, with a good range of payment options to boot. Everything seems to be in line here with very little to complain about. Timeframes are standard and minimums and maximums are fair. Undoubtedly the number one destination for fans of esports betting, Betway are the official sponsor of the popular team Ninja’s in Pyjama’s. Betway cover more matches than any of their main competitors with a surprising range of markets on some, while others are understandably simply win/lose. Additionally, there are usually a few targeted promotions designed specifically for this market, and they are good ones too. You can bet on Counter Strike: GO ESEA Europe and North America, Rainbow Six Brasileiro and Challenger League, as well as the League of Legends Iberian Cup – so if you know what any of that means and you like to bet, then Betway is the place for you. As virtual’s go this is a good effort from Betway. The graphics are of a decent standard and the events run every 3-5 minutes depending on what you are betting on. Market range is limited by the fact that none of it is really happening, but there’s a good handful of options if betting on fictitious sporting fixtures is your bag – it fills the time between real games we suppose. We did find the scenarios could do with balancing out a little – for example there are a lot of penalties in virtual football, and some of the commentary feels slightly amateur in one or two of the categories. However, in general it is not an unpleasant way to spend 15/20 minutes or so while you are waiting for a real world fixture to begin. 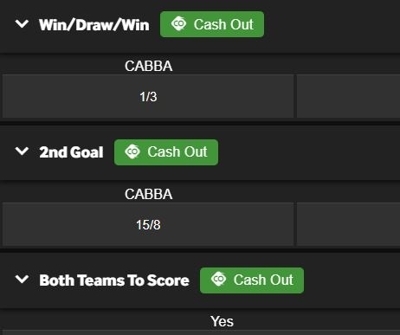 It would be a huge disappointment given the positivity so far if Betway did not support cash out, well not only is it there but it is there in force. Cash out is available on almost all in-play markets and most others besides. If you want to earn money using cash out then it is all about timing: cash out too soon and you could be doing yourself a disservice, whereas if you get greedy and hang on for too long you could end up missing the boat. At its most basic level, cashing out is settling your bet before the event has finished for an adjusted set of odds depending on what the current situation in the game may be. So, if you bet on West Ham to win 2-0 and at 75 minutes the score is indeed 2-0 West Ham, your cash out price will probably be quite good. If, 5 minutes later, the score is 2-1 you will be wishing you had taken it, but if you cash out and the score is the same at the final whistle you will have done yourself out of some money. This is where things get a little more confusing but not by much. Betway offer customers the chance to cash out a part of their bet. Sticking with the West Ham scenario above, you could choose to cash out 50% of your bet at 75 minutes to ensure a profit at the adjusted price, but leave the other 50% in at the original price. In this way, if the score changes you have still made money on 50% of your bet, whereas if it doesn’t you have done yourself out of less money than if you had cashed out 100% of your original bet. It gives the customer much more control over their bet and also the freedom to play with it once their stake has been made. In terms of enjoyment it provides quite a boost as well, since you are constantly on the edge of your seat weighing up the options and analysing the game. A blog is probably not everyone’s idea of fun, but the blog on the Betway site is a pretty useful feature. Not only is it crammed with new content every few days, but some of that content can be very helpful in shining on a light on some potentially rewarding bet lines you might otherwise miss. You can organise the articles by sport and then by competitions within that sport so you can really zero in on what you are interested in, and the large team of writers are experienced and knowledgeable in their chosen categories. 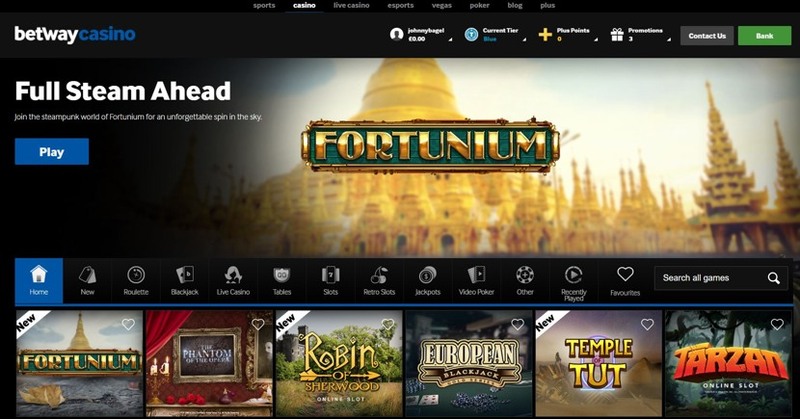 The Casino product is powered by Microgaming, one of the most popular slots providers in the business; and there are more than 400 slots to choose from in the Casino with more still from other providers in the Vegas section of the site. If slots aren’t for you then one of around 50 Blackjack, Roulette or other Table Games should keep you entertained while you are waiting for the next game/race to begin over at the Sportsbook. You can also play in the Live Casino and interact with the dealer and other players as you go, or get stuck into a few rounds of Poker if you have the time. In short, if gaming is a sideline then you are well covered at Betway. Read our full review of the Casino here. The Betway website is a pretty slick customer. Splashes of green against the plain black background make all of the headings stand out, resulting in a clean and instantly comprehensible interface that allows punters to navigate immediately to where they need to be. It never takes more than a second for each new page to load, either, so the site glides along smoothly as you use it. In fact, if you step away the site could almost be described as basic or stripped back, but it never feels cheap, and the bettor is certainly not short of options or features – those options and features are just structured carefully so as not to get in the way of one another. 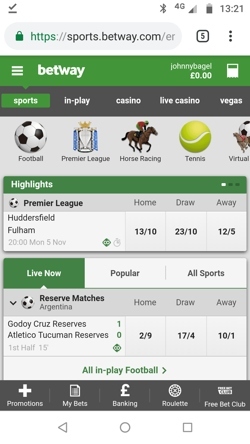 The Sports A-Z clearly shows if there are any live games currently taking place within that category, and once a category is selected you can see which events have cash out options, too, both of which are a time saver and a big help; plus, there are some Quick Links that update daily as well as shortcuts to popular markets that save even more time. The logical display and effective functionality make the whole thing incredibly user friendly and the platform it runs on is clearly finely tuned. A joy to use. The mobile site feels quite different to the desktop site, but that is by no means a bad thing. We loved the desktop site for its structure and flow, but we have equally good things to say for the mobile offering. 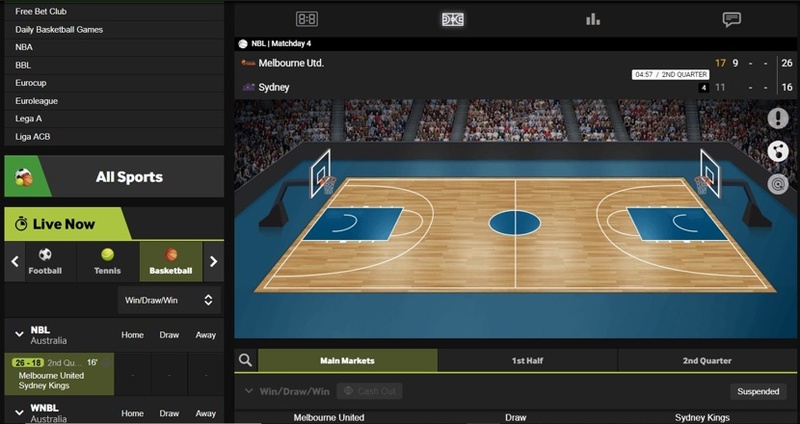 While it looks and feels different, many of the features such as in-play betting behave in the same way once you start using them, so it won’t feel alien to you if you are used to the desktop. The different icons for each sport are great, keeping things fun and playful, and once again the events and markets are displayed with a structure that makes each next step feel logical. 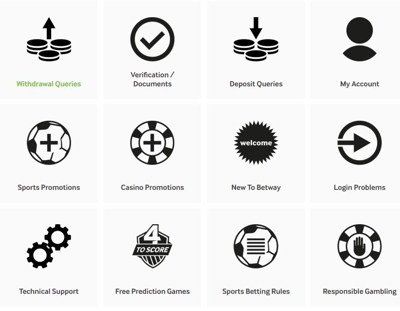 The interface will always display shortcuts to your Betslip, Promotions, Free Bet Club, and Banking, so managing your open bets and account activity is practically instant; and a menu button is always on hand which will shunt the interface to one side, granting access to your Account, Favourites, Quick Links, and A-Z. It’s no exaggeration to say that this is one of the best mobile products on the market. It has everything you need to bet on the move or from the terraces and it works hard for the punter while at the same time making everything feel so easy. It is incredibly enjoyable to use. Betway is a part of the Betway Group and holds licenses throughout Europe, although they are officially based in Malta and Guernsea with supporting offices in London, Cape Town and the Isle of Man. A truly global company then whose website comes in 11 languages. Big on advertising and sponsorship the Betway brand can be seen at sporting events countrywide, but they really upped their game from 2014 onwards shortly after Richard Akitt became CEO, signing a sponsorship deal with Premier League Darts as well as several major horse races including the Queen Mother Champion Chase and the Yorkshire Cup. Horse Racing has remained an area of focus for Betway ever since. They seem positively addicted to sponsoring football teams throughout Europe, perhaps most notably, though, Betway became the main sponsor of West Ham Utd in 2015, which was also the year they began advertising in the ESports market, sponsoring the ESL UK Premiership. This was the beginning of their involvement with a market they have now pretty much cornered. 2015 was a big year for Betway in Casino land too, as they paid out a world record jackpot of £13.2 million to one Jon Heywood who got lucky indeed playing Mega Moolah. This may have hurt their pocket but it certainly brought them plenty of attention from the gambling community. Betway Group promotes an image of inclusivity, openness, and responsibility, and this comes across in the way they operate. As a group they manage several different brands from Bingo to Casino’s, and now employ around 500 staff. Anthony Werkman took over as CEO in 2017, so it will be interesting to see how things progress under his tenure. If you are someone who likes to bet with a small but expertly curated portfolio of bookies then Betway should definitely be on your list. The selection of interesting events coupled with the frequency of top odds across the board means they are a great bookie to use alongside a few other favourites. 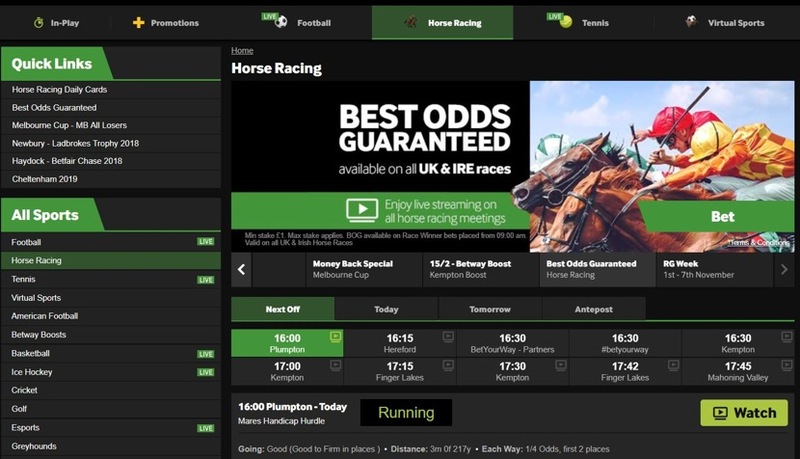 Since this is all hosted on a site that runs like a dream and allows the user to nip about quickly checking odds and stats, you should find that Betway serves your needs perfectly. Other people who should consider using Betway are those who wager on E-Sports – you will struggle to find anywhere better. On paper Betway is doing everything right here. They provide multiple ways to get in touch and ask for help covering phone, email, live chat, and even a dedicated social media account; and what’s more, at least one option will be available to you 24/7. However, it is a real hassle to find some of these options, especially Live Chat which is probably the most sought after, which is just annoying when you want a quick answer to a simple question. We eventually gave up and Googled it. To access Live Chat you have to go via the FAQ, then indicate that the answer was not helpful, at which point Live Chat will become an option. It wouldn’t be so bad if the FAQ in the Help Centre allowed for a greater level of self help, but it seems to say an awful lot without really saying anything at all making it a pointless extra hoop to jump through. All of the support possibilities are fine to use once you get going, but why do they have to make it so tricky to find? Live Chat – Another bookie that make you work for your Live Chat privileges. It’s buried deep in the bowels of the Help section, but once you find it you will be alright. Email – support@betway.com is the address to use for e-mail support. Response times tend to be good at 12 hours max. Phone – From the UK call 0808 238 9841 and it should be free from a landline. & days a week 8am – midnight. @betwaysupport – Dedicated support account that is updated every day with comedy memes, promo’s, random giveaways, tips, and info. They have even been known to re-tweet their followers’ cry’s for help if deemed worthy enough.